Still waiting for Fifth Capital to sign S106 agreement. They in turn are waiting for the land owner, Comer Homes, to approve. Planning permission isn’t finalised until S106 is signed. Fifth Capital still trying to agree price with builders. Demolition will be carried out before main build contract is let. Fifth Capital likely to keep ownership of commercial ground floor space. Community meeting on 2 June. In April last year Bristol City planning committee told the Carriageworks developer to go away and improve their planning application. Up until that point CAG had had a rather hostile relationship with the developer, Fifth Capital. But afterwards we managed to sit down together and find out what we each wanted to achieve. Over the following months there were many changes to the scheme. By October, when it went back to the planners, we felt that it was good enough to secure our support albeit with reservations especially about the amount of affordable housing. The planning permission has to be formalised by the signing of the S.106 Agreement. This is a legal document mainly, but not exclusively, concerned with contributions to affordable housing. The main signatories are the Council and Fifth Capital, but the landowner also has to sign and that’s our old friends Comer Homes. They are dragging their feet, failing to respond and because of that everything else is getting held up. We’re told that Comer just needs to agree the last details of wording and it can then be signed. We wait, and we wait. Once the S.106 agreement is signed Fifth Capital are able to exercise their legal option to buy the site. Comer are then out of the picture and Fifth Capital can get on with the rest of the development process. Once the S.106 is signed the developer has two years to start on site. Since last October Fifth Capital has been trying to agree a price with its builders for carrying out the work on site. The site has lots of risks, mainly to do with demolition of Westmoreland House and protecting the listed Carriageworks building. In fact the Carriageworks building is so dangerous that no one can even go inside to work out what needs to be done. When it comes to building works, higher risk means higher price. Conversely, the lower the risk, the lower the price. Fifth Capital are therefore going to split the contract so that demolition and shoring-up take place in a separate contract. That will allow surveyors and the like to get into the Carriageworks to figure out what needs to be done. That will reduce the risks for the builders and allow them to give Fifth Capital a final (and lower) price. Before any demolition work begins the travellers currently living on the site will relocate. Safety and peacefulness is in everyone’s interest. With Westmoreland House demolished, the Carriageworks shored up and the price with the builders agreed, the building works can begin. Fifth Capital are talking to Housing Associations regarding the long term management of the residential units. We’ve had discussions with Fifth Capital about the ground floor units. Currently they are thinking of retaining ownership of the units, having a management company oversee the lettings and a separate company run the market. They agree that the company should have local input from other businesses and residents in the area. But at the moment everything hangs on Comer. Heard that one before? With all the delays there are inevitable questions, and they usually begin “what if …. ?” What if Comer Homes don’t sign the agreement, what if Fifth Capital can’t agree a price with the builders, what if Fifth Capital sell the site, what if there’s no Housing Association, what if the ground floor units aren’t let, and so on. What if Comer or Fifth Capital doesn’t sign the S.106 Agreement? The S.106 Agreement creates the legal agreement between the Council, the landowner and the developer that secures the affordable housing units. Until it is signed there is no planning permission in place, just a recommendation from the Planning Committee to grant permission. If the S.106 does not get signed the planners will have to take a report back to the Planning Committee. The Committee then has two options: 1) Decide that there is a different way of securing the affordable housing or 2) decide that the S.106 will not be signed and that the affordable housing will not therefore be secured. If the latter, the Committee would then have to consider whether the permission should go ahead without any affordable housing or whether planning permission should now be refused. What if a build price can’t be agreed? If the cost is too high then the profit goes down and eventually it becomes uneconomic to build. The developer then has three options: 1) Change the scheme so that the cost is lower and/or the value is higher 2) Sell the site to someone else and let them figure it out 3) Do nothing and sit on the site until values go up and/or costs go down. Developers will normally aim at a profit of 20% of the development value – this is what they make in return for their effort and financial risk. Last September Fifth Capital said they were aiming at 17%. What if Fifth Capital sell the site before building? This is always a possibility. Fifth Capital might be able to sell their option on the site – that depends on the legal agreement with Comer. But it would be more likely that Fifth Capital would wait until they’ve signed the S106 agreement and purchased the site before selling it on; that way they’ll maximise the value. If they do sell it there will be a new developer to deal with. That developer may try to change the planning permission in order to increase the value of the development and their profit. This is something we’d need to be alert to. Is this likely to happen? Marc has consistently said he intends to build out the scheme so we don’t think it is likely. But you never know. In theory we could go back to compulsory purchase. This was previously on the cards because Comer owned the site but was making insufficient progress redeveloping it. Knightstone were lined up to back the compulsory purchase order (CPO) but that process ground to a halt when Fifth Capital emerged. If Comer again block the scheme or if another owner just land-banks the site then the CPO process could be restarted. The Council would have to demonstrate that the owners are unable or unwilling to develop the site themselves and they’d also have to find a new development partner. Difficult, but not impossible. What if there’s no Housing Association or tenants for the ground floor? Essentially this means there would be no one who wants to buy the scheme. In this market, that’s unlikely. If it were the case it would suggest the price is too high. The price could be lowered but eventually it would get to the point of being uneconomic to build (see above). If there was no Housing Association it would mean there would be no organisation willing to take on ownership and management of the affordable units – but the developer would still have to build them as it’s a condition of the planning permission. If there were no tenants for the ground floor it suggest a need to revisit the rents and/or terms of occupation. Space generally finds occupiers if the price is right. We haven’t met since December but whether or not there’s real progress we felt we needed to see you all again! So: Thursday 2nd June, 6:30pm, venue to be confirmed. Marc Pennick of Fifth Capital will be there to tell you what’s happening and, we hope, confirm that Comer is no longer the owner and that building works will be starting soon. Cross your fingers. Make sure the Planners hear you…. Whether you’re for or against the revised proposals from Fifth Capital, it’s important the Planners hear your voice. Here’s what to do. 1. Have a look at the revised proposals. Technically (i.e. the planners tell us) the only issues for consideration are the ten points raised at the April committee meeting. Everything else is taken as agreed. However, don’t let that get in the way of a good argument! Deadline: For Planners to take your comments into account in their final report they need to hear from you by Tuesday 29 September. 4. Come to the Planning Committee (A) – 6pm on Wed 14th October at the Watershed. The best way to make sure the Planning Committee know what you think is to read your statement out to them. 5. Then sit and listen (quietly – eh hm) to the Committee’s deliberations. 6. Retire gracefully to celebrate / commiserate / disect depending upon what you said in 2, 3 and 4 above. This morning CAG Chair Lori Streich went on BBC Radio Bristol to talk about the Fifth Capital planning application. In their introduction the BBC focused on the proposals to gate the development at night and the failure of the scheme to genuinely respond to the Community Vision. They describe Stokes Croft as “Bristol’s alternative area”, home to people with strong views about how their neighbourhood should be. Reference to the Tesco riots four years ago and opposition to posh flats that have nothing in common with the rest of the area. But council officers see nothing wrong with the scheme. So what’s the problem with knocking down an eye-sore and replacing it with flats? Lori says the main objections are lack of social housing and that units for sale are priced beyond local affordability. Pennick says that sale values will be lower than those in the viability appraisal – nothing higher than £300k. He says that values are reasonable for the local market, as demonstrated by what he has been told by local property agents. Pennick says this is a brownfield site with a listed building so he can’t afford to provide more affordable housing. Pennick says CAG have given wrong advice about the planning application and makes a proposal about what he describes as erroneous descriptions of a gated community. He says that at this evening’s planning committee he will propose a S.106 agreement be signed and “this will basically put into place that these gates will never be able to put on this site and close on an evening (sic). That is a legally binding document”. We assume that what he meant is ‘It is not and will not be a gated community even at night’ but his wording wasn’t exactly clear. Pennick is challenged over his response to the open letter from local creatives etc that resulted in him criticising Wallace and Gromit. He says he doesn’t like open letters and that none of the signatories have ever contacted him to ask for a meeting about their concerns. When asked if CAG will work with Fifth Capital, Lori says yes and suggests that Fifth Capital withdraw their application and then work with CAG and a social housing provider to come up with the right scheme and provide a solution for the site in line with the Community Vision. She says there is a passion to see the site redeveloped in the right way and stop it staying dereliect for another 40 years. Hear the interview: http://www.bbc.co.uk/programmes/p02mr41m#auto 1hr40mins in. Viability Appraisals are a key document for proving whether or not a developer can afford to provide social housing. Historically this has been considered a commercially sensitive document which even the members of the planning committee won’t see, although this view is starting to change and increasingly the appraisals are being released to the public. So, knowing its importance for the Carriageworks, we put in a Freedom of Information request back in early February, and yesterday the document was released. The Viability Appraisal has been prepared by Upside London, specialists in advising developers on affordable housing. Unfortunately both the Appraisal and the assessment of the appraisal, which the Council commissioned from BNP Parisbas, have been heavily redacted. So we can see the framework of the appraisal but not the actual numbers used. It’s worth noting though that a recent decision by the General Regulatory Chamber, which hears appeals against the decisions of the Information Commissioner, has cast doubt on whether developers and Councils can withhold any of the information in a viability appraisal. They concluded “We find it particularly hard to accept that the pricing and other assumptions embedded in a viability appraisal are none of the public’s business. They are the central facts determining the difference between viability and non-viability. Public understanding of the issues fails at the starting line if such information is concealed, and discussion of the “point in time” nature of viability models is frustrated.” CAG would obviously like the redacted information released before the Planning Committee makes its decision on 8th April. A 3D model produced by Fifth Capital shows the proposed buildings towering over the neighbours. 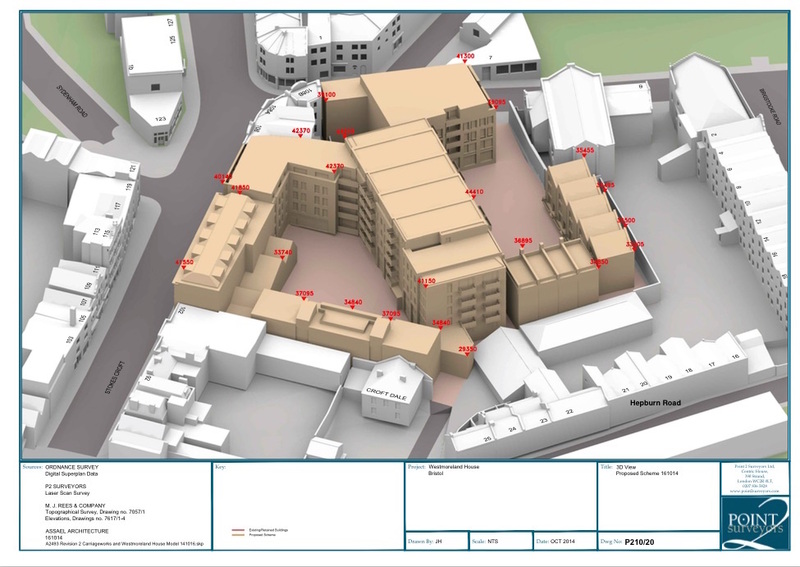 The submission by Professor Costas Georghiou describes the way in which the scheme comes right up to the boundary thereby reducing their potential for redevelopment. Neighbours have also voiced alarm about shadowing and overlooking. This model clearly shows how intimidating the new buildings will be. A senior Planner has slammed the Fifth Capital proposals for the Carriageworks. He says it should be refused planning permission as it is contrary to Government and City Council policies and against the principles of sustainable development. Costas Georghiou is Visiting Professor of Architecture & Urban Design at the University of Wolverhampton and was previously the Chief Planning & Highways Officer for the City of Wolverhampton and Head of Urban Design at Bristol City Council. In an objection lodged with the City Council Professor Georghiou maintains that the proposals for 118 flats and houses on the site represent over-development and will be detrimental to the living conditions, amenity, health and well-being of future residents. Fifth Capital have claimed that the economics of developing the site mean that the proposed density of development is essential. But Professor Georghiou says this should not be an excuse for poor and sub-standard development especially where it creates poor living conditions and is both damaging to the wider community and contrary to policy. In particular Professor Georghiou highlights the lack of natural light and ventilation that will afflict over half the flats as a result of only having one external wall. In many cases this wall faces North East and thus away from the path of the sun. The resulting lack of sunlight will have not only health implications for residents but will also mean higher heating bills due to the lack of solar gain. The lack of sunlight also impacts upon the open spaces in the scheme. While artist’s impressions show courtyards bathed in direct sunlight, the reality is that the tall buildings will cast long shadows thus meaning that the spaces will be far from attractive areas for residents to sit in and relax. It also means that the proposed vegetable garden will be in shade throughout the afternoon. Professor Georghiou has also criticised the way in which some of the blocks are too close to the southern boundary thus impacting upon any future potential to redevelop neighbouring sites. Residents in Hepburn Rd have voiced similar concerns and are alarmed at the proximity of the buildings to their gardens and back rooms. The cramped development also means that the gardens for so-called family houses are much too small and will not provide the space for children to play. Finally Professor Georghiou points out that the huge 86 space refuse store is much too close to residential units which will suffer from smells and contamination. Professor Georghiou sets out the steps that would have to be taken to make the proporsals acceptable including reducing the height of residential blocks from six to four stories, giving apartments double aspects in order to increase natural daylight, moving residential units away from refuse stores, moving one of the blocks away from the boundary with neighbouring properties and increasing the size of gardens. In the absence of these steps he firmly believes that the City Council must refuse planning permission.